WWW.VSMUSIC4U.COM DUO PIANO AND VIOLIN POP MODERN SONGS- THE BEST HITS!!! Wedding Ceremony, Cocktail Hour, Dinner Parties, Fashion Shows, Special Events, Corporate Gatherings,Christmas Parties ,Birthday Parties, Anniversary Parties. VSMUSIC4U was probably the best vendor to work with during our wedding. First and foremost, Vinny was very responsive to all of my emails. I always received a response to a question or concern within a few hours!!! We were able to meet and listen to a few selections before our wedding which was awesome. My husband and I immediately fell in love with their passion and talent for music. I actually had goosebumps when they played the traditional bridal march. They will also compose any song you request, which is awesome! The day of our wedding, they arrived early and we received so many compliments about how well they played during our ceremony and cocktail hour. We recommend VSmusic4u to anyone. YOU WILL NOT BE DISAPPOINTED!!!! 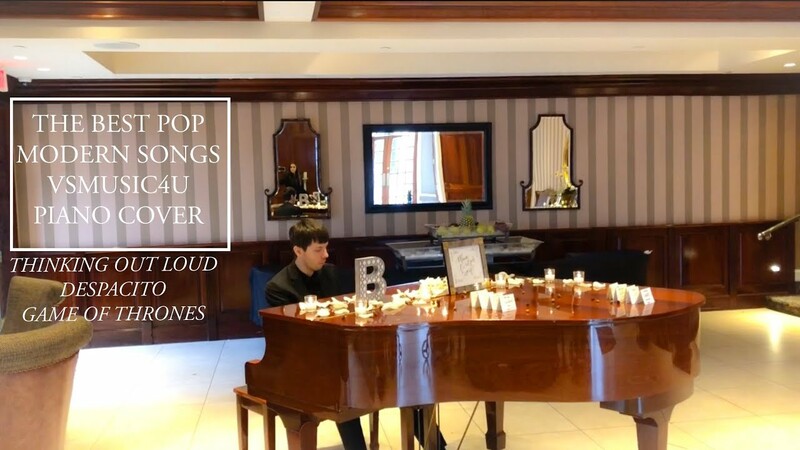 Beautiful and memorable music for our wedding day! We booked with Vsmusic4u just a month before our October wedding. We had talked a lot about having strings at our ceremony but hesitated on adding an additional vendor to the day. 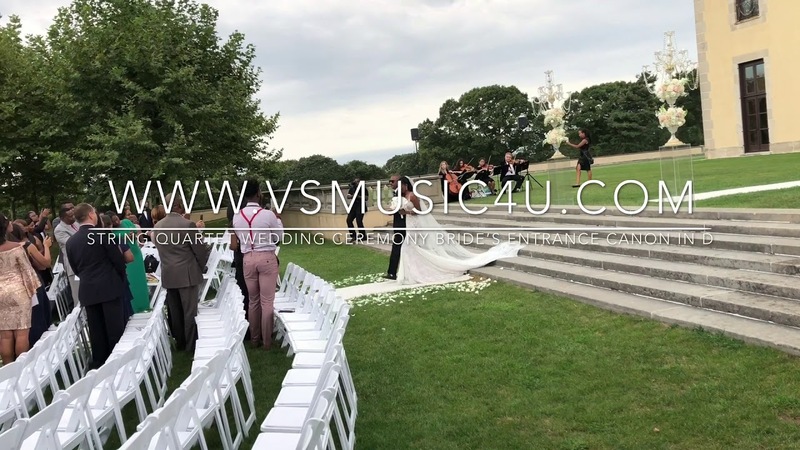 I am so happy that we decided to book Vsmusic4u as their music turned out to be one of the most memorable portions of our wedding celebration. They were professional, on time, extremely gracious and accommodating. We received rave compliments from many of our guests. I could not have imagined our wedding day without them there. Thank you! Look No Further!!! Working with Vinny was seamless from start to finish! His attention to detail and overall respect for the event was impeccable! The string quartet and Vinny arrived On Time and filled our venue with elegant, timeless classical music. Highly recommend! My only regret with booking Vinny is I didn't get to hear him play :-( .. I heard sooooo many awesome reviews about Vinny's music selections and blends from my guests, and I'm so sad I missed them since I had to be in hiding before the start of the ceremony. However, when I heard him play my processional song, Thinking Out Loud, I was immediately in tears. It was absolutely beautiful. Thank you so much Vinny. I can't wait to see the wedding video just to listen to you play. As a whole, Vinny was professional, communicative, and receptive to all of my song suggestions, which I really appreciated. Thank you Vinny! 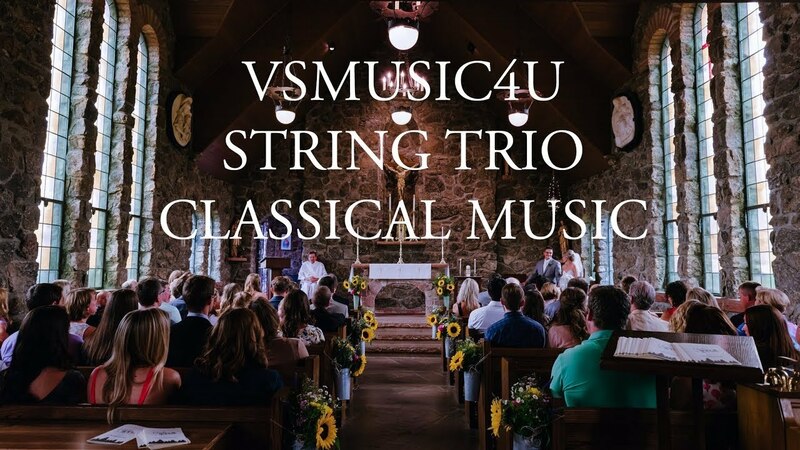 I contacted VSmusic4u an year ago looking for a string trio for my wedding and let me tell you: this ended up being one of my best decisions for our wedding. Communication leading up to the date was awesome and I had all my questions answered. I sent Vinny a list of our requests and the musicians fulfilled every single one of them. Last minute we decided to have a piano for our welcoming and Vinny himself step in and performed beautifully. I strongly recommend this company for their talent and high professionalism. Don't delay, book them, you won't regret it! We got a VSmusic4u duo violin and cello for our small, intimate wedding ceremony on the beach. We each had our favorite song as an entrance: Thousand Years for me and the Star Wars theme for my husband. After the ceremony the played some Top50 hits which our friends and family really enjoyed. We were extremely happy with booking this vendor and we would do it again in a heartbeat. Booked them, they are the best!!!! Me and my now husband really wanted to do something special for our wedding ceremony and cocktail hour...so we decided to have a string quartet play all of our favorite movie and video game themes. It was not easy to find such a company because most quartet have a standard repertoire. Then I found VSmusic4u. The musicians were absolutely amazing and played every soundtrack we requested, even some very odd one's that only me and my husband would like. We highly recommend VSmusic4u, they will surely deliver the best music and will allow you to customize your own song list. The Best musicians, highly recommend!!!! We are so lucky we found and booked VSmusic4u for our ceremony, cocktail hour and first dance. My husband and I had a string quartet and it was the best decision we could ever make. Vinny was so helpful and accommodating and the best wedding vendor we worked with. Every time I had a question I called or emailed him and he answered in minutes. The music was just perfect and the musicians were extremely professional, talented and played all the songs I wanted to hear. Our guests kept complimenting us the entire night and even weeks after the wedding on choosing the string quartet. We can not be happier with our decision to go with VSmusic4u and really cannot say enough great things for Vinny and his musicians. It was an absolute pleasure working with Vinny. From the moment we interviewed on FaceTime we knew we had to have them perform at our cocktail hour and wedding ceremony! Vinny was very responsive through email and never hesitated to address our concerns. Thank you for making our day so special ... we wouldn’t change a thing! Out of all the decisions I had to make when helping my sister plan her wedding, this is by far my best!!! Vinny and his colleagues were absolutely amazing and wonderful to work with. My family is from Haiti and I wanted to incorporate Haitians songs during the cocktail hour and in only two weeks, Vinny was able to learn 6 different songs. The guests were dumbfounded!!! I wouldn't hesitate to recommend this company or use them again in the future!! I am so happy we found them. We coordinated with Vinny to provide ceremony and cocktail hour music. He was quick to respond and incredibly helpful. He had no problem playing any song we requested and also accompanied ceremony singers we hired on our own-- which was just above and beyond! I can't recommend them enough! Was a pleasure working with over the last year of wedding planning. They are ex tremely talented, have a LARGE list of songs from many genres you can hand select . Vinny is extremely timely in email responses, and very willing accommodating. 5 stars! A beautiful touch, highly recommend. Thank you! VS did an incredible job at our wedding. They provided top notch service for our ceremony and cocktail hour. We and our guest were all so impressed with their musical abilities, it was a highlight of our wedding. They accommodated all song requests and did them flawlessly. Very Professional and helpful with choosing Ceremony Music! We used VSmusic4u for our wedding mass and they did not disappoint! The music was beautiful and sounded amazing in the church. Vinny was so easy to work with and responded to all emails within a day and answered any questions I had. Thank you so much! I can't even begin to describe in writing how incredible it was working with VSmusic4u. Their professionalism, enthusiasm, skill, and performance amazed me. The entire process left nothing to be desired. I honestly couldn't believe how smoothly everything went. I highly recommend using VSmusic4u for any important occasion in your life. We were looking for a live band to play during the cocktail hour of our wedding. We wanted a band at a decent price who could play an array of music, including traditional Indian and Bollywood songs. And we found that in VSmusic4u. They went above and beyond. They played every song we requested and our guests enjoyed it very much. They made the entire night memorable. Highly recommend. VSmusic4u did an excellent job and did exactly what we asked for. With all of the headaches leading up to our wedding, it was such a relief that we did not have to worry about the ceremony music at all. We simply exchanged a few emails in which I specified what I was looking for and Vinny provided me with suggestions and advice. It turned out perfect. I got the sense that if I had wanted to have additional discussions or required more details, Vinny would have been absolutely fine with that. I would definitely recommend VSmusic4u and Vinny to anyone looking for experienced, professional musicians. We booked VSmusic4u for our November Wedding and we absolutely adored their music. We hired a pianist to play at the cocktail before the ceremony and a string quartet during the ceremony, cocktail hour and our first dance song All of Me by John Legend. We couldn't have asked for better musicians as we got so many compliments from our guests. Vinny and the others are so professional, accomodating, talanted and the communication leading up to the wedding was so easy. Me and my wife will recomend the to all our friends. Don't hesitate to book them right away!! We got married on Sunday, October 11, 2015. We booked a string quartet from Vmusic4u to play during our Church Ceremony. We booked them about 6 months before the wedding, and communication was excellent the entire time - Vinny is very easy to talk to, and very professional. It was absolutely beautiful! They played a requested play list, and every song was perfection. I highly recommend them, and we personally will book them again in the future! We had VSmusic4u at our corporate event and they were an incredible and perfect addition. They really brought our event to the next level. Excellent musicians playing classics as well as current hits with the perfect twist and expertise! We would hire them again in a second! We HIGHLY recommend them! I just really wanted to say how extremely talented you and your beautiful wife are. My guests could not stop raving about how amazing everything sounded. Me and nick are so happy that we found you guys and you made our wedding so special and unique. To say thank you isn't enough to express my gratitude. I will spread your name around if i ever hear someone in need of live musicians. Thank you again to you and your wife!! These 2 people are truly talented and to have them at your event would easily make it 100 x's better!! Just outstanding! We hired VSMUSIC4U for our wedding ceremony and cocktail hour, and I must say we could not have asked for better musicians. They were so professional from beginning to end (and I mean from beginning to end, from when I first reached out for a quote to the end of their performance). They played every song we requested, and so many people told us afterwards how much they love the quartet. I am so happy that they were a part of our wedding, and would recommend them to everyone! VSMusic4U was absolutely amazing at my wedding. They were also thorough with information and great with staying in contact with the bride. I'm so happy that I chose them to be the ceremony and cocktail hour musicians. Many of my guest also praised the wonderful work they did. I'm truly thankful for them and their beautiful talent. Absolutely the best money I've ever spent!!! Vinny provided Exceptional service and I would do it all over again in a single heart beat !!! VSmusic4u did such an amazing job at our wedding. We asked them to play current pop songs with the keyboard and violin during the ceremony and cocktail hour. The groom came out to Ed Sheeran's Thinking of You, the bridal party came out to John Legends's All of Me, and the bride came out to Justin Timberlake's Mirrors. Our guests are still talking about how beautiful the music was during the ceremony. VSmusic4u plays incredible music and are very talented. We cannot wait to hear the video with their music. Vinny made the whole process leading up the wedding very pleasant and even allowed us to come a week earlier to hear the music that we wanted. Give them a call right away!!! I highly recommend VSmusic4u. You will not be disappointed! My husband and I got married last week (it was a small ceremony) and we hired Vinny and his wife to play the piano and violin as guests arrived as well as during and after the ceremony. They were PHENOMENAL. My husband and I were so pleased with their professionalism and best of all, you can send them a list of songs (even foreign) to learn and play. So many of our guests commented on how beautiful their music sounded and how well they played all of the songs. They stay in contact with you throughout your planning process and are honestly the best musicians we found for such a great price. They truly have a passion for music and you can tell just by the way that they play. Thank you guys so much for making our ceremony so beautiful. I loved VSMusic4u! Sounded beautiful for my ceremony! VSMusic4U & Vinny were such a pleasure to work with. I booked a violin & cello duet with them and they sounded beautiful the day of. It helped a lot that there were familiar with my venue (Crest Hollow Country Club),so they were able to address the little nuances associated with them (no amplified music, layout, etc), without much involvement from me. This is a big plus when you're a bride with already a lot on your plate! He was lightening fast in replying to emails, very helpful in suggesting ceremony songs, prompt, and when I heard the music right before I waked out, I knew I made the right choice. I even caught a bit of them during cocktail hour and they were still impressive. Everyone praised my ceremony musicians and I couldn't be happier with my choice. Their prices were very reasonable, and I would recommend them to anyone for any event in the future! I recently booked Vsmusic4u for my son's First Communion and I must say it was indeed a great experience. I am so pleased to have picked them. They are very professional and they have fulfilled my every wish. They were on time and well dressed for the occasion . I am looking forward to booking them for my next event. Vsmusic4u did an amazing job and I can't recommend them enough ... When it came to the ceremony, they played everything we asked for beautifully and on queue, and the ceremony was flawless. Leading up to the ceremony, they were very nice and professional. They were able to answer all of our questions and accommodate every request (even a last minute request) with ease; which was very reassuring. Again, I couldn't be happier with the service they provided and would recommend them to anyone. Vinny and his entire ensemble performed beautifully at my wedding and cocktail hour. The booking process was extremely easy and his communication leading up to the day was great. No pressure at all. They knew every song I requested. I received many compliments from my guests for their cocktail hour musical performance. I would recommend them to anyone! DON'T HESITATE! Just Book them! The service was unreal. Very responsive and mega talented. We couldn't have asked for a better team! I truly recommend VSmusic4u to anybody looking for a string group. They played excellent on my ceremony and cocktail hour. I gave Vinny a list of all songs that me and my husband wanted and they played each one of them. Last but not least they gave me the best quote I could find online. I am extremely pleased with hiring the VSmusic4u quartet to play at my wedding ceremony and cocktail. The whole experience from the first email to the last song was great. We didn't have a very big budget but they worked around it and made the best offer we could find. I truly recommend VSmusic4u to any bride looking to book a top classical music ensemble for a reasonable price. You can now customize your upcoming event according to your taste, preferences and budget. 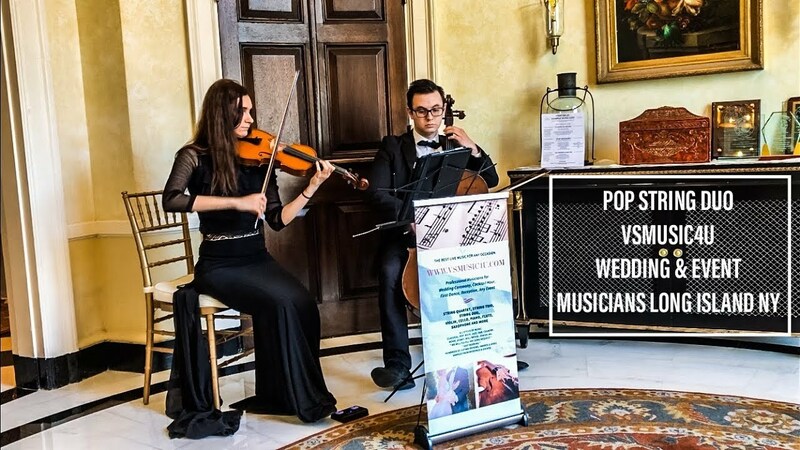 We have provided LIVE music for hundreds of weddings and events and each time our clients have been highly satisfied and have strongly recommended our musicians to their friends and family. We have small ensembles for smaller, more intimate weddings or events and big ensembles for grand celebrations with hundreds of guests. 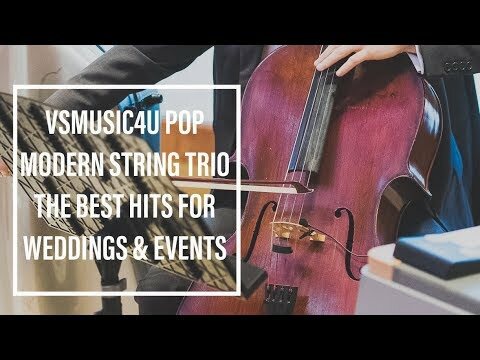 VSmusic4u can provide all kinds of ensembles for your Wedding Ceremony, Cocktail Hour and Reception. (Select piano, violin, viola, cello, double bass, flute, saxophone, trumpet, harp and others.) You choose the right group of musicians (from Duo to Orchestra) to suit your budget, space and taste and we make the best music for your important occasion. Our repertoire covers all music genres from all Classical Composers to all your favorite current songs and artists. (Classical/Romantic, Pop, Latin, Jazz, R&B, Opera/Broadway/ Disney) We are also able to fulfill any special requests you may have. Choosing VSmusic4u's LIVE music is a guarantee for making your special day even more magical. We promise that your guests will be talking for a long time about the talent and artistry of our experienced musicians. We perform all songs from any style of music!! !